After 13 years of dedicated service as the dean of the Bayer School of Natural and Environmental Sciences, Dr. David Seybert will step down from his position as of July 1, 2013, to resume work as a full-time faculty member in the school's chemistry department. 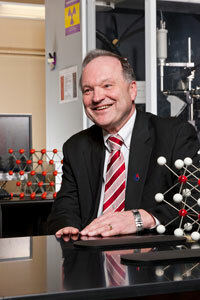 A member of the Department of Chemistry and Biochemistry since 1979, Seybert was named interim dean of the Bayer School in 2000 before being named dean in 2002. During his deanship, Seybert has led the school through a period of significant growth, including increases in both freshman enrollment and research funding. In fact, in 2011-2012, faculty from the Bayer School received $2.9 million in research grants, with $560,000 in overhead, to support their scientific research programs. Keenly aware of the importance of state-of-the-art laboratories and equipment, in 2010, Seybert, along with Drs. Jeffry Madura and Philip Auron, applied for and received a $1,692,088 grant from the National Science Foundation to fund renovation of research laboratories. This marked the largest renovation grant in University history, and the project is set for completion by the start of the 2013-2014 academic year. Another important issue for Seybert is the state of STEM (science, technology, engineering and mathematics) diversity in higher education. To that end, he has supported programs such as Project SEED throughout his time as dean. The eight-week program for economically disadvantaged, academically talented high school students offers hands-on experience in chemistry research and lab experiments. According to Dr. Jennifer Aitken, associate professor of chemistry and coordinator of the program, Seybert's support has been paramount to the success of Project SEED over the last 10 years. "It's likely that you're going to change the life of one of these students," she said. Another STEM initiative supported by Seybert is the Bayer Scholars program, which helps academically talented and motivated women and minority students majoring in chemistry or environmental chemistry. The program provides financial aid, mentoring and research and internship experiences in an effort to attract and retain more diverse students in the chemical field. The first cohort of Bayer Scholars graduated in 2013, and they are success stories for the program. Two have obtained full-time employment with Bayer MaterialScience, and two others are attending graduate school at Duke and Yale universities beginning this fall. In 2012, Seybert took to the road to serve as a panelist discussing the state of STEM diversity in higher education at the National Press Club in Washington, D.C. The forum—Bridging the Gap: STEM Diversity and U.S. Higher Education—examined the undergraduate college environment in which students of divergent genders and nationalities make their career decisions. Most recently, Seybert, along with Drs. Jeff Evanseck, Jeffry Madura and Ralph Wheeler, Department of Chemistry and Biochemistry, and Dr. Alexandra Santau, School of Education, was awarded a $617,850 grant from the National Science Foundation for Scholarships for Academically Talented and Financially Disadvantaged Undergraduate and Graduate Students. In addition to his responsibilities as dean, Seybert was recognized for his research when he was inducted into Duquesne's Office of Research Hall of Fame in 2011. He also has served on numerous University committees, including as chair of the organizing committee for the 2003 symposium Stem Cell Research: Science, Ethics and Religion. In 2008, he co–chaired Green Chemistry: Solutions for a Healthy Economy, the Rachel Carson Legacy Conference. He has authored numerous abstracts and refereed manuscripts, and has mentored both graduate and undergraduate research students. Also during his tenure at Duquesne, Seybert has served as an Oak Ridge Associated Universities Faculty Research Fellow at the Pittsburgh Energy Technology Center and served as a consultant to Upsher Smith Laboratories Inc. in Minneapolis. He also has taught at Cornell and Duke universities during his graduate and postdoctoral appointments respectively. Outside of academia, Seybert serves on the Education Planning Commission of the new Cardinal Wuerl North Catholic High School and is a member of an educational and communication advisory board for the Diocese of Pittsburgh. He also served on the Bishop Canevin High School Board of Directors and has coached soccer for the Chartiers Valley Soccer Association and Our Lady of Grace School. Seybert, who resides in Scott Township, holds a Ph.D. in biochemistry from Cornell University and a B.A. in chemistry and biology from Bloomsburg State College.